If you watch South Korean TV programs regularly, you know Mukbang is everything. While it started out small with a single host and online audience on internet webcast, it has since grown. It’s been years since the start of the trend, yet it has no intention of dying down soon. In fact, the trend even caught the interest of mainstream media internationally, resulting in popular non-Korean YouTube stars reacting to this particular trend and doing their own Mukbang with local food. So how did Mukbang become so popular in South Korea? What makes it so special that after years, people still go crazy over it? The concept of Mukbang first originated from small, individual broadcasters on streaming platforms such as ‘Afreeca TV’ in 2015. The original format only included a single host with large amount of food and an online audience. While eating food, which ranged from pizza to noodles and others, the hosts interacted with the audience through a chatting room. Some would answer requests from their audience to eat the food in a certain way, and some would just sit silently and eat. Not long after, the trend inspired different variations and adaptations of “Eating while Broadcasting” concept. Many national TV channels started producing shows that involved “eating.” Moreover, they even produced dramas that solely focused on people expressing their love of food, such as tvN’s “Let’s Eat” drama series. While there are several explanations to why the trend had become so popular, I want to focus on two main reasons. In my opinion, these are the key factors of Mukbang that make the trend unique, stand out from other trends. But, let’s first watch this legendary chicken Mukbang scene from tvN’s “Let’s Eat” with Yoon Doo-Joon, because why not? The problem is that these trends come and go rather quickly; they don’t stay in one place for a very long time. One minute everyone is wearing skinny jeans, and then suddenly everyone is wearing boot-cuts. No one expects a trend to last forever, and no one can guess upcoming trends. Due to the fast-changing environment, South Korean TV programs have evolved and gone through many different phases regarding their concept. Like I’ve previously mentioned, they first passed through “real variety” programs like MBC’s “Infinite Challenge,” to survival and audition programs like “Mnet’s “Produce 101.” The current phase, in my opinion, is “observing” programs, but who knows how long that will last? However, this does not apply to food. Food is a necessity, not a trend. It’s something everyone has to consume in order to survive. Food as a subject is literally, timeless. It was here, it is here right now, and it will be here, always. Most importantly, people crave for delicious and better food all the time. No one deliberately eats bad-tasting food, unless they are on a diet and forced to chug down a kale smoothie. People are always on a lookout for new restaurants that can satisfy their cravings, whether it be new, fancy 5-star restaurants, or small and independent local restaurants. This search will never end, and here is where Mukbang comes into place. One of the main things that happen on Mukbang is celebrities going on a journey to find hidden recipes and restaurants. Comedy TV’s “Delicious Guys” serves as an epitome of this type of “Eating Broadcasting” programs. The four members of the program go on an adventure to find restaurants that feature a certain type of food each episode. Afterwards, the featured food becomes a hot topic among young adult viewers, who seek out these restaurants. Yes, it’s possibly the programs partner up with restaurants in advance to increase profit, but if the public likes it, it’s a win-win-win situation. The programs gain profit, the restaurants gain customers, and the public gains new favorite restaurants. Now that’s a deal that seems worth taking, am I right? With the subject of “food” being timeless, I would like to discuss the next reason why Mukbang is such a big deal right now. There is no limit to what you can do with food. You can play games about it, you can talk about it, you can host a cooking competition. The sky is the limit! The whole trend originally started with a pure intention of eating while broadcasting, but it takes more than those two to get people’s attention nowadays. Thus, TV producers started incorporating other elements with food, resulting in an array of Mukbang programs. 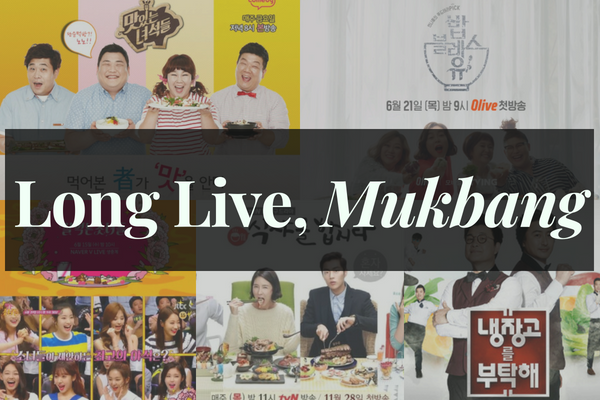 For example, O’live channel’s newest program “Bob Bless You” incorporates the concept of radio shows with Mukbang, taking the “eating broadcasting” to another level. At the beginning of the show, the four members do exactly what you would do in a typical Mukbang programs. They pick a certain type of food for the episode, share their secret recipes, express their excitement, and think about what to eat next. However, what makes “Bob Bless You” different from other Mukbang programs is that they don’t just eat. Before deciding on the food, they read messages sent from their audience. The messages read personal stories that mostly composed of embarrassing moments they would like to forget. At the end, they ask for the members’ suggestion on what type of food to eat based on their stories. Afterwards, the members each suggest food until they agree on one, and eating it for the audience who have sent their stories. I’ve only listed one program as an example, but the spectrum of Mukbang programs is overwhelmingly wide. JTBC’s “Please Take Care of My Refrigerator” incorporates food and competition, and “We Will Eat Well” combines food and idol girl group. I believe that they will continue to think of more collaborations, and Mukbang will not come to an end at least for another few years. While I specifically listed two reasons for the success of Mukbang programs, they might not even matter that much. Personally, these “eating while broadcasting” programs simply give me pleasure, and that’s why I and most people watch them. Seeing the celebrities eat food that we would eat makes me feel closer to them. On the other hand, seeing the celebrities eat food that we cannot possibly afford, they satisfy our cravings for us. In conclusion, food is everything. Long live, Mukbang.